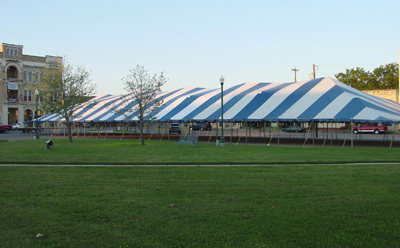 Your neighbors will think the circus has come to town when you set up a Premier 70 x 190 Ultimate Party Tent; this weather resistant pole tent is perfect for any large social event, from family reunions to fundraisers. The kit comes with everything you need, including the canopy, poles, stakes, ropes, and storage bag; it even comes with a demonstration video to make set-up easier. The canopy is made with heavy-duty "Block Out" to protect your guests from the sun and edged with 2-inch seatbelt webbing for extra strength and durability, able to withstand up to 70-mph gusts of wind depending on the type of ground used for set-up.